Stumbling out of bed this morning required the immediate addition of several layers of warm clothing. 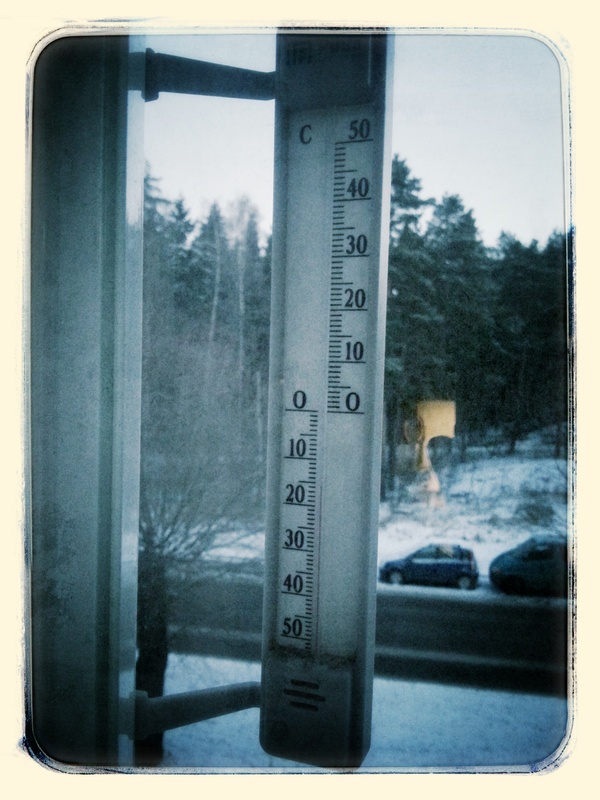 As I made my way to the coffee, I peeped at the thermometer outside our kitchen window: -17C (that’s 1.4F for those of you not using the metric system). Yes, it’s freezing; but, beyond the cold, we have clear, blue skies and sunshine! A week ago, Helsinki temps were hovering just above freezing and the days were darker than dark given the constant cloud cover, persistent rain and lack of snow. I don’t mind telling you that everyone was in a foul mood, myself included. Meanwhile, many parts of North America, suffering the great Polar Vortex of 2014, were experiencing the sort of temperatures and weather common for Helsinki this time of year. It was odd. One week on, we’ve had a very tiny bit of snow to brighten things up even with clouds, and the mercury has plummeted. This is winter. And, with winter and the colder temps, we get winter sun, which is a very much welcome sight.